Dorothy is lovingly remembered by her beloved daughter and best friend Dianne (Donnie) Smith of Satsuma, Florida; loving daughter-in-law Sheila Pickering of Moose Jaw, SK; her nephew Dave Cawthorne (Lynn) of Puslinch, ON; daughter Barbara Pickering of Toronto, ON. Dorothy was predeceased by her only son, Ray Pickering, who passed away almost 6 months ago, several nieces and nephews, aunts, uncles, her parents and her sister. Dianne would like to express her heartfelt thank you to Sheila for all she’s done for mom for the past 4 years. Mom it broke my heart to lose you. My life will never be the same. I’ll miss our daily morning and evening phone calls to each other and I will miss you terribly. Rest in peace as you are with your beloved son now. 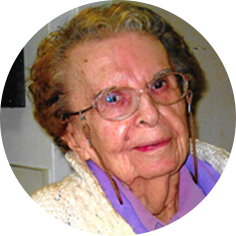 Dorothy Pickering passed away very suddenly in Moose Jaw, Saskatchewan on March 8th, 2016 at the age of 100. Dorothy had been living in Moose Jaw for the past 4 years. At the age of 99 she was still living in her own apartment in an assisted living facility. In April of 2015 she fell and broke her hip and was confined to a wheelchair. For the last 10 months she had lived in a long term care facility. Dorothy was born and raised in Toronto, Ontario. She put herself through secretarial school and became a secretary in various companies in Toronto. Among them was a radio station where she would receive 45 records as soon as they went on the air and later worked at a prestigious golf club in Toronto and before she retired at age 60 she was a private secretary to the president of a stock exchange company also in Toronto. Dorothy loved to travel when she was younger and had visited such places as Japan, China, Portugal, Alaska, Bermuda and Switzerland. Her favorite place was Switzerland.